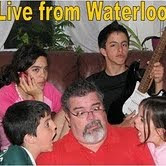 Live from Waterloo: Friday's Feast #07 - Two in one! Friday's Feast #07 - Two in one! Note: The Friday's Feast website is down today, so I just came up with my own personal version of Friday's Feast for this week... Then I found Bethany's website with more (and better redacted) questions, so I'm playing both! Appetizer - What would be your most treasured memory of your childhood? I'm not sure... the first memory that came to my mind was when I was about 9 or 10 years old and scored a goal playing a soccer game with my uncle Ernesto and his friends. Not only I was the only kid on the field, I was an awful soccer player; they just let me play because I was getting annoying, but then I found a ball bouncing in front of me, I kicked it as hard as I could... and it went in! I thought I was in Heaven. Soup - When was the last time you just 'bit your tongue'? Yesterday morning. Can't say more. Salad - Name that silly fact about you that was unknown...until now. Back when I was a kid, I was afraid of a newspaper, because it had an article about a Dutch school teacher that had died climbing the Aconcagua. I was so impressed by that, that I hid the newspaper behind the chimney, and would come back periodically just to check that it was still there... only to put it back and run away (I bet it's still there after more than 30 years!). Main Course - You're a superhero, but with 'non typical' superpowers. What would your super powers be, and what would you like to be called? My 'non typical' superpower would be the ability to turn healthy vegetables into meat! I'd like to be called 'Atkins Man'. Dessert - World Cup final, Olympic Games, Superbowl, World Series, NBA finals, Stanley Cup... which one would you like to play in? 1. What are some of your favorite websites? Mostly newspapers from Argentina (Ecos Diarios, Clarin, Ole) and here in Waterloo (The Record). Those I visit every day. Then, my blogbuddies; and after that, my guilty pleasures: sites like TMZ and Enemigo del Silencio (both dedicated to gossip, the latter also from Argentina). 2. If you had boy/girl twins today, what would you name them? Mmm... the boy would probably be José (my middle name) and the girl Verónica Agostina (I chose both my and my wife's favourite girl names). 3. What was your favorite grade in elementary school? Did you have a favorite teacher? I think it was grade four, back in my hometown (Necochea, Argentina). I don't remember my teacher's name, but I liked her very much. Same with grade five, and I do remember the teacher's name (Teresa). 4. What types of punishment did your parents use while you were growing up? Which were most effective on you? 5. Can you parallel park? Did you have to parallel park for your driving exam? Yes, I can. I mean, most of the times. OK, sometimes I am just terrible! And yes, it was part of my driving exam both in Argentina and then in US. Bonus: Use this site to find where you should live. What are your top 5 and have you ever been to them before? Thanks, Gabriel! You're a life saver! Excellent questions! Gabriel this is such a great idea. Will you be doing this every week too? If yes, please let me know, I'll join next week. I am not able to join today because I had to do so many things. Thanks again for the invite ;) Take care. Great idea! I'm working on my answers now!! :) Thanks! Además, te imaginaba yendo a verlo y salir corriendo!!! Voy a ver si empiezo otro blog, más personal para poder participar de estos quiz... me encantan!! The questions are far better then what we are used to, that's at least my opinion. But for me it's too late to play now and on top of it I have a bad cold and can't either live or die ! I hope it will be better by tomorrow ! Fun, fun! That's so funny that we both put questions up! :) Have a good weekend. I added a link to your questions from my blog as well. Thanks for the post. I played along! Too funny...Lewiston, ME was one of mine too. My son's gf is from there. thanks for the heads up amigo! my second time to pass. hope i could join the feast next week. swamped with office and school stuff. not that i'm complaining. Leigh Ann, Becky, Patti, thanks for playing! Jenn, which ones were difficult? A simple life, I don't think I can come up with a whole fresh set of questions every week like the Friday's Feast people do... I wish I could! Paola, come on, give it a chance! It's a lot of fun, and you get to know many interesting blogs (and people!). You know what? I will write a story about the newspaper thing. It's time to confess my darkest secret! Gattina, you made me blush. Mamichelle, that's too big of a coincidence. Poor man's Nicole Richie,well thanks! I will add you to both as well. Great feast questions and answers! I agree with your dessert. Participating in the Olympics would be awesome! Just wanted to let you know ... I FINALLY got my answers up! :) Have a great weekend! Whoa! I knew that someone may host one today but I just opened my PC and in a while it will be Saturday already. But, I love both of your questions! I know I'm late, but I'm still playing. Thanks so much for the heads up :-) Have a great weekend. I love your answers too! That is pretty funny about the hidden newspaper.